During the fall, it is almost guaranteed that I have a head of cauliflower in my refrigerator. The larger heads can easily make two meals. Occasionally, I can find stands that charge by the head instead of by the pound. It’s these weeks that it feels like we’re eating all the roasted cauliflower recipes. I am under the firm belief that most produce items go through a magical process when being roasted. All it takes is a little oil, salt, and heat. The caramelization makes the cauliflower perfectly tender. Plus, the flavor mellows and sweetens just slightly. It’s a winning combination of texture and flavor. 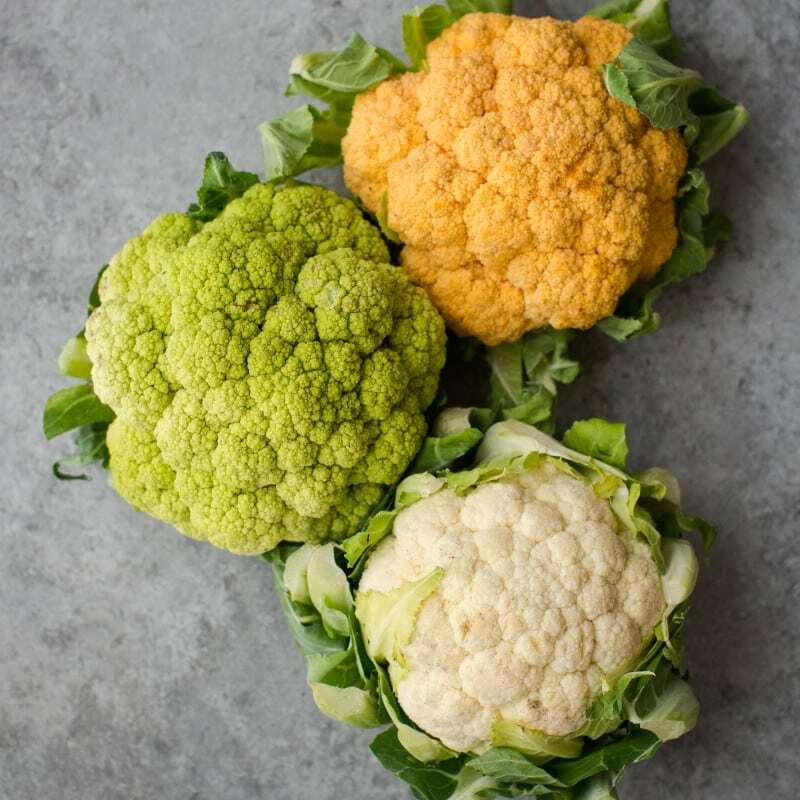 At the market or store, you might orange, green or purple cauliflower. They are beautiful and just happen to be quite similar to their white counterpart. The flavor and texture isn’t much different but they retain their color well, even when cooked. For most meals, you can swap orange and purple color for white, no problem. I just might recommend you steer clear of using purple cauliflower for soups. The color might be a bit off-putting! Also, one quick note about romanesco. This beautiful green fractal vegetable is often cozied up with the cauliflower. Romanesco has a slight resemblance to cauliflower. However, it is really it’s own brassicas that taste a bit more like broccoli. I’ll swap romanesco for cauliflower in things like salads and grain bowls. What I love best about cauliflower is the ability to take on almost any flavor in the roasting process. Alliums such as garlic and shallots are lovely companions. Spice and spice blends, such as cumin, coriander, or curry powder also work well. However, my favorite cauliflower combinations often include tossing cauliflower in flavorful sauces and pastes like harissa, romesco, and mole. Of course, there’s always the popular buffalo version too! 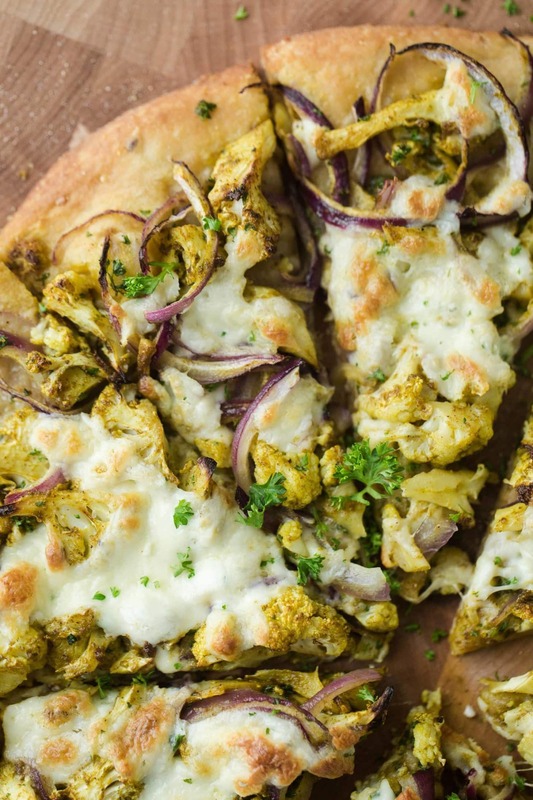 Beyond just playing around with flavors, cauliflower works for many different kinds of meals. 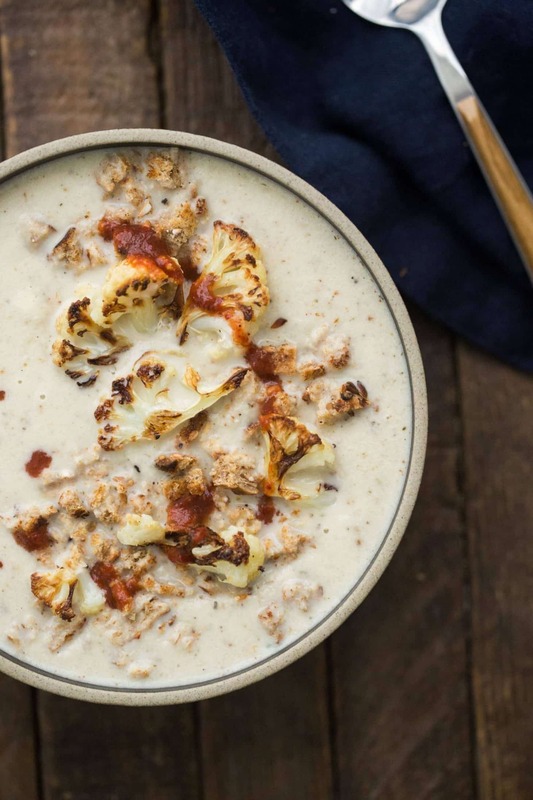 Below are a few ways to use cauliflower for breakfast, lunch, or dinner! 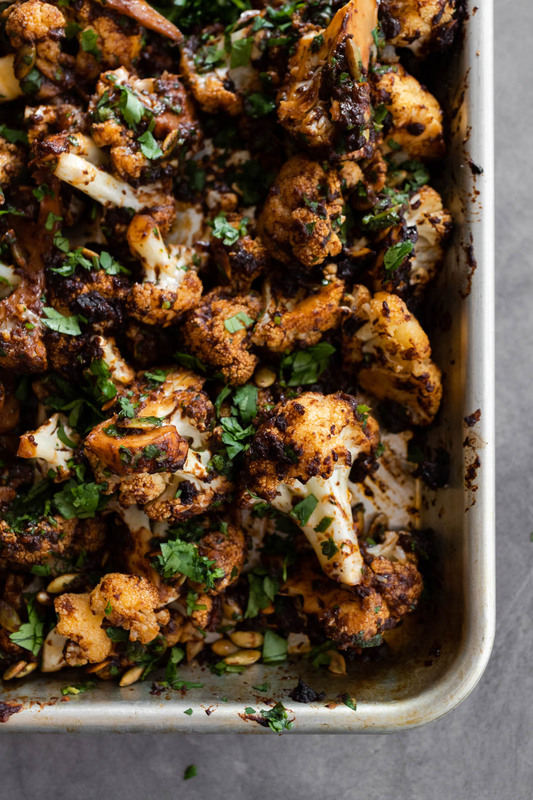 This recipe can be used as is or boosted with any of the optional add-ins such as herbs, spices, and sauces: perfect for many different kinds of roasted cauliflower recipes! Heat your oven to 425˚F. Remove a small part of the stem base from the cauliflower. Remove the leaves and carefully cut the cauliflower into bite-sized florets (you can also roast the stems and cauliflower leaves!) Transfer to a sheet tray and toss with the olive oil, sea salt, and any optional items you might like to add. Place the cauliflower in the heated oven and roast. Stir once after the cauliflower has been in the oven for about 20 minutes. Continue to cook the cauliflower for another 10 minutes or so, until the cauliflower is tender and caramelized. Eat, use in salads, or use in recipes as desired. 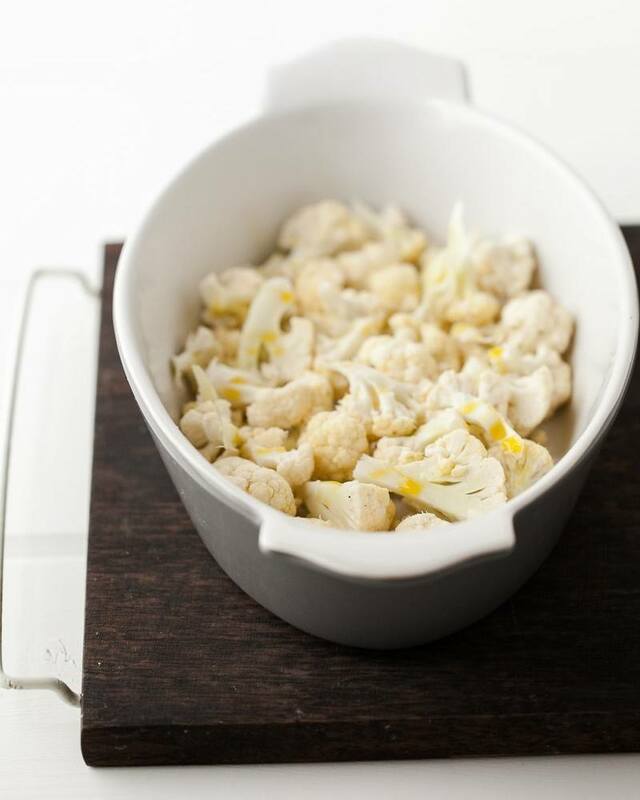 Tips + Tricks: 1, 2lb head of cauliflower is roughly 8 cups of cauliflower florets. Roasted cauliflower makes a great component. Roast the entire head and save part for a future meal!